Deepak Chopra has recently shared a great visual model that helps us all to focus in on what your core life purpose is, or should be. Often we travel routes without clear destinations, take paths into unknown territory and offer things to the world that don’t perhaps resonate as well as they might with our competencies or the potential value that others see in us. 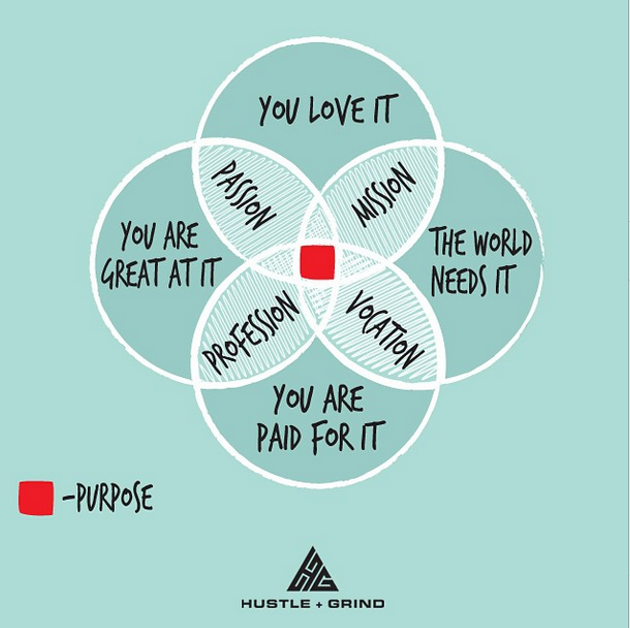 So this model, courtesy of hustleandgrind.co helps us to breakdown our Purpose, or maybe Focus, into chunks of thinking where we can clarify what is most relevant, important and helpful. Use the model to make lists against each of what you are great at, what you could be paid for, what does the world need from you, and what do you love doing? Prioritise your lists. Then take the top three in each. These prioritised lists will help to identify you ideal profession, vocation, mission and passion. Then combine these four ingredients and your Purpose or Focus should materialise. This may become your destiny which will manifest in the years to come if you point your energies in its direction and make supporting decisions that fuel that journey. For many more great models, thinking and help with manifesting your great future, visit Deepak Chopra’s website and pick up your own copy of the Hustle and Grind image.